Why did this have to happen on Thanksgiving? Caught between two worlds, stressed-out college junior Clayton Gaines must fight inner and outer demons or be lost forever. His desperate life becomes a living, breathing, video game existence, lacking only a reset button. The twenty-something quickly finds he’s surrounded by death and romance as he enters into a love triangle with a attractive female intelligence agent and the young, charismatic, crowned prince of a foreign land. Facing a devastating invasion of unfathomable creatures and torn with sensual passions greater than he ever imagined, Clayton is forced into a fight for his life. Danger and passion run high in a place where the rules keep changing. Such is the nature of SpaceFace. 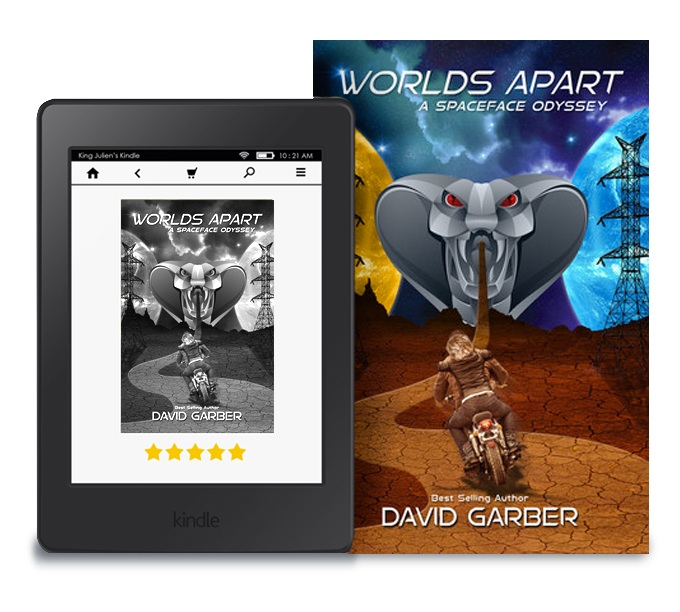 Worlds Apart offers entertainment, adventure, humor, and for those with eagle eyes, imaginative minds, and a knack for solving puzzles, a prize for breaking the hidden code. He had saved hundreds of lives. He had vanquished mythical demons, slayed dragons, defeated hordes of invaders, creatures of untold horror. As a gamer, he had brought peace to Earth many times. But this day was different. Nothing he had done before had prepared him for the mess in which he found himself. This was real life. It was Thanksgiving, the one this twenty-two year old would never forget. It dwarfed Armageddon. That’s what LMU junior Clayton Gaines realized as he hid from his relatives and other dinner guests at his parents’ home. The truth was he didn’t want to see or talk to anyone until the Xanax he stole from his mother’s medicine cabinet kicked in. Under the best of circumstances Clayt hated being trapped with relatives. Mercifully, like the flu, he only endured this gut-retching once a year. Clayt was caught between his mother’s shabby chic credenza and his father’s oft’ confused brother, Uncle Earl. He replied with a unique smile, somewhere between absent and a deer in the headlights. Clayt couldn’t help himself. It was true that in the last 18 months he had changed quite a bit. Sort of a late bloomer. Since high school he went from a rather rotund 5’8” chunker to his current 6’1” and a very solid 182 pounds foundation. His metamorphosis was certainly a welcomed, if not astonishing transformation. Gone was the smooth baby face, replaced with a manly, trendy scruff. The only change he hadn’t experienced was in his eyes. They were still sultry, as tropical blue as Caribbean waters. When he smiled they illuminated through his long, dark eyelashes. It was as if they were powered by two ‘D’ batteries. To Clayton’s own acknowledgement, practically overnight he went from an also-ran nag to a champion thoroughbred. Whether he could emotionally handle that sudden change was still TBD. “Maldito sea!, Clayton estás casi tan alto como tu padre. Obviamente la Universidad te ha sentado bien. ¿Qué es lo que estudias? “Me especializo en estatura y llevo una segunda opción en genética”.